The healing powers of crystals and gemstones were known more than eight hundred years ago by the mystic Hildegard von Bingen and as far back as two millennia ago by the Greek physician Dioskurides. In this full-color illustrated guide, Ewald Kliegel explains the benefits of incorporating crystal wands into your bodywork and healing practice and details the techniques of doing so. Exploring the energetics of crystals and their interactions with the physical and energy bodies, including the overall sense of well-being they impart that underlies their other beneficial effects, the author explains how the versatile shape of a crystal wand amplifies the crystal’s energetic effects and offers advantages in massage and reflexology over other shapes of crystals and stones. The larger rounded end can act as a crystal sphere for massaging knots or large areas, whereas the tapered end is ideal for stimulating reflex zones, targeting acupressure points, and tracing meridian lines. Starting with the foundational set of three wands to begin your toolkit: Rock Crystal, Red Jasper, and Aventurine, the author examines the healing properties and indications for more than 70 crystal wands, some easily available and others quite rare. He shows how easily-available Amethyst clears the head, relaxes muscle tension, benefits the lungs, nerves, and skin, aids digestion and constipation, helps dissolve blockages and addictive behavior, and combats fatigue. He explains how crystal wands can be divided into 3 energetic categories--neutral, stimulating, or balancing--and details how to select the proper wand or wands for each healing situation. The author provides step-by-step instructions for incorporating crystal wands into massage and reflexology treatments, for their use in energy medicine, specifically for internal tuning of the aura and balancing the chakras, and for using crystal wands for protection, power, and relaxation. He also explores the use of crystal-infused oils and balms to increase the healing effects of massage. Helping you to enhance your bodywork practice or advance your self-healing work with crystals, this practical guide reveals not only the many healing applications of crystal wands but also the sheer beauty of these powerful energetic tools. Do Crystal Wands Really Work? 1. First massage the zones shown in the figure below for 2-3 minutes with your fingers. 2. Then repeat the massage fifteen minutes later with a crystal wand made of rock crystal, amethyst, chalcedony, or sodalite. 3. Finally, massage these zones again half an hour later with a snowflake obsidian crystal wand. Experience has shown that a massage using snowflake obsidian causes the feet to feel warmer soonest. If you try this application again on another occasion and change the sequence, you are still certain to achieve the best success with snowflake obsidian. The test demonstrates that your choice of crystal wand clearly increases the effectiveness of the massage. For example, if you have some experience with massage for back problems, you may consider supporting the stroking massage movements in between by using wands made of aragonite, aventurine, serpentine, or bloodstone. The back muscles will relax much faster and the effect will go much deeper. However, if you use a piece of red jasper or basalt for such problems, it will take much longer for the relaxation effect to be noticeable. 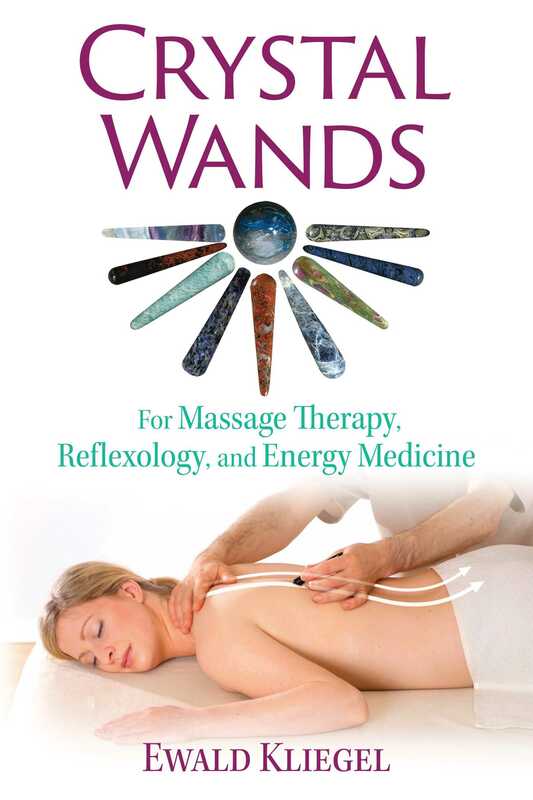 Massaging with crystal wands has several immediate advantages. First of all, we are relieving the physical strain on ourselves by using crystal wands; we are being kinder to our hands, our most important tools. But the main reason for using crystal wands is this: the shape of the wand allows us to utilize the energetic quality of the crystal, thereby vastly increasing the efficacy and healing potential of the massage. It is, of course, important to choose the right crystal for the purpose, and this will be discussed in more detail. But, simply put, we will require crystals that provide us with three basic qualities: an activating, a balancing, and a neutral quality. Therefore, the basic set for massage with crystal wands includes three wands: rock crystal (neutral), red jasper (stimulating), and aventurine (balancing). These three basic qualities can then be amplified by fine-tuning with other crystal wands, and we have approximately 70 different crystal types at our disposal! However, questions can usually be reduced to whether a treatment calls for stimulation or a calming effect, both of which can, of course, be carried out in many different ways. No matter whether the goal is relaxation, composure, heightened awareness, or increased stamina, massaging with crystals brings about a perceptible and characteristic sense of well-being that underlies all other beneficial effects. The effects are long lasting, and if crystal wands are used in the treatment the desired state will be achieved more quickly and stabilized more permanently. Last but certainly not least, in addition to enjoying the sheer beauty of crystal wands, we can employ these energetic tools in our everyday livesfor self-massage, to help us feel good and to treat our own little niggles and complaints. Aventurine (green) encourages relaxation and sleep. It helps switch off thoughts that go around and around in the head as well as reducing stress, internal restlessness, and nervousness. Green aventurine is good for oversensitive or irritated skin and for heart complaints. It alleviates inflammation, sunburn, and sunstroke when applied in a verygentle, stroking massage. It can also be applied if lack of rest is leading to blockages of the body and/or mind. Bloodstone (heliotrope) helps with setting boundaries so as to achieve a better grip on life. It alleviates irritability, aggressiveness, and impatience and revitalizes in cases of exhaustion. Bloodstone is the echinacea of crystals. It fortifies the immune system, which is why a massage with this crystal is very good for colds and the beginning stages of illness. Bloodstone also fortifies resistance to illness, relieves inflammation, detoxifies, relieves acidity, and helps with heart complaints. Jasper (red) is the crystal for activity and dynamism. It enhances courage and the ability to assert oneself, lends energy and drive, and helps with persistent weakness and tiredness. Physically, red jasper stimulates circulation, thus having a warming effect if one is susceptible to feeling cold. Massages with red jasper are perceived to be strongly activating, so they should not be carried out late in the evening. Rock crystal, being a neutral, clear quartz crystal, is practically universally applicable. It lends energy in the right amounts and encourages clarity. Massages with rock crystal are satisfying and relaxing while at the same time bringing renewed vitality. Rock crystal is cooling and refreshing, alleviates pain, increases awareness, opens the senses, and encourages willingness to take in new things. Because rock crystal has fortifying qualities, it can help one perceive the physical body more consciously. Snowflake obsidian helps with pain, psychological and physical blockages, and the consequences of accidents, injuries, and operations. It dissolves states of shock, even shocks on the cellular level, and thereby helps to overcome blockages in healing. Massage with snowflake obsidian helps with irregularities in blood circulation, cold extremities, as well as general fatigue, weakness, and lack of motivation. Snowflake obsidian raises energy on all levels.